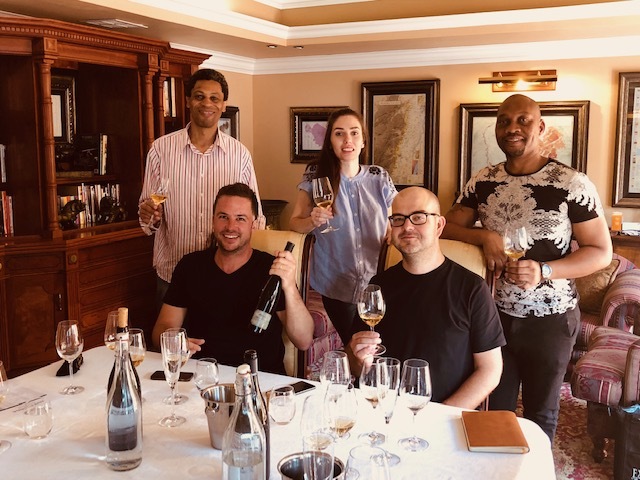 The Mosaic Team assembled in full force this past Tuesday, to welcome winemaker, Craig Hawkins from Testalonga and David Clarke, the distributor of his wines from ExAnimo to taste a few of his 2018 vintages. The label of the 2018 vintage Cortex is one of Craig’s favourite stories, “borrowed” from a friend and shows a sulphur miner working to break up solidified sulphur to carry out of a volcano crater floor. He laughs that his friend was wearing a gas mask at the time while the miner was casually lighting up a cigarette on his break. 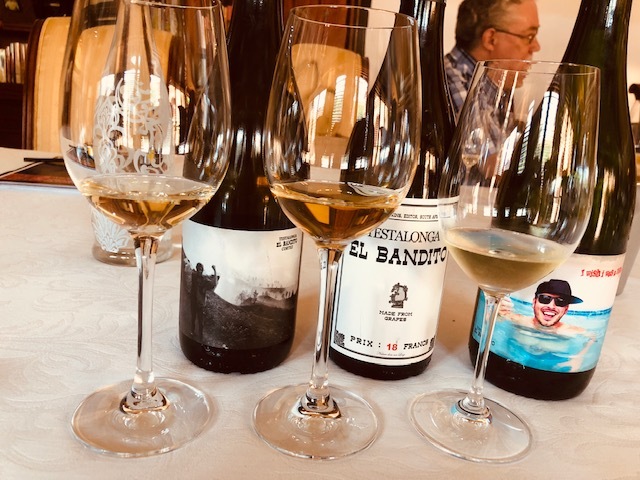 The Testalonga El Bandito Cortez is generally a more delicate and soft-spoken wine from organically grown Chenin Blanc grapes. It is produced from the same vineyard every year, where a high proportion of silica and quartz adds tension to the wine. “It was named after one of my favourite live songs “Cortez the Killer” by The Dave Mathews band,” Craig laughs. Colour: A light straw-yellow colour with some golden-amber hues. Bouquet: The aromas at first are more mineral than fruity, showing notes of flint, wet stone and white stone fruits such as white pears and peaches. After some time in the glass notes of honey and tropical fruits appear, adding complexity to the nose. Palate: The palate has initial flavours of white pear and green apple, but evolves after some time to show hints of dried fruits and perfume. It has a very good acidity that ties nicely with the low alcohol, creating a smooth and clean taste. This is an excellent food wine and can be experimented with a variety of flavours, such as matured cheese, cured ham and even Japanese cuisine. We recommend decanting this at least 2 hours before serving. 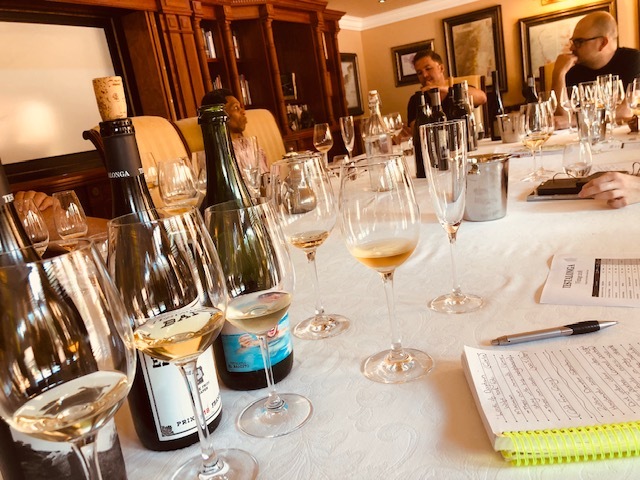 Ageing: Craig states that you can drink the wine now and appreciate its mineral notes, but can also easily keep for the next 5-6 years when the fruit-forward flavours will come out to play. Colour: Dark straw yellow with distinctive copper hues. Palate: The sweet spice notes found on the nose follows through to the palate with the addition of herbal flavours – clean and smooth, lingering in the aftertaste. Again the acidity ties the wine, keeping it tight while still displaying good structure and weight, – a wine that will pair well with food, but we recommend to drink this with like-minded friends that will appreciate what this wine represents. Decant about 2 hours before serving, to appreciate a fully developed wine. Ageing: Craig recommends to taste this wine again in another 3 years, to allow for the flavours to develop. The name for this Pétillant Naturel – literally meaning “naturally sparkling” wine – came about when Craig, Carla and their good friend Matthias Warnung were busy crown capping / bottling this Pét Nat made from 100% Colombar, during harvest and were discussing Ninjas, which was when Craig said: “I wish I was a Ninja”… Craig remembers that another good friend Paul Jordaan (the guy on the label) said to him after he showed him the label and name: “I really do!” (…want to be a ninja) – so it all fitted. Colour: A straw-yellow colour with a fine mousse that looks more like a fizz. Bouquet: A fresh, bright sparkling wine with aromas reminiscent of the freshest apples and peaches, showing candied notes of lemon meringue and “grape skin”. Palate: Just off-dry and absolutely delicious, it’s “like lemonade for grown-ups”. It has a good acidity that counters the sweetness, leaving a refreshing taste in the mouth. It almost acts as a sorbet to clean and refresh the palate. Ageing: The wine is delicious to drink now – enjoy in its youth. 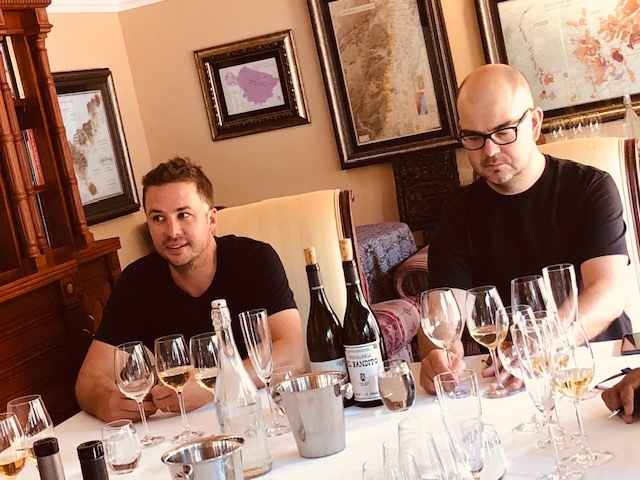 Craig proclaims these to be his “top of the line” wines – the ones that define him the best and represents most accurately the vision he has for the future of his wines. Inspired by the “orange wines” of Anjou in France, these wines are made in its purest form… to be enjoyed with good food and good friends. It was a refreshing experience to meet Craig at long last and hear him tell the stories about his wines – viewed as fun and carefree because of the quirkiness he shows on his labels, it was clear to the team that this is a winemaker that takes his craft very, very seriously, making wines that is pure and unadulterated – just the way he wants it.